A blend of Jonathan and Golden Delicious apples, New York native Jonagold offers a unique honey-tart flavor and crispy, juicy, nearly yellow flesh. It debuted in 1968, a product of the New York State Agricultural Experiment Station. With a yellow-green base skin color and a red-orange blush, it is excellent both for eating fresh and for cooking. Jonagold is typically available October through July. Jonagold apples are harvested in October. 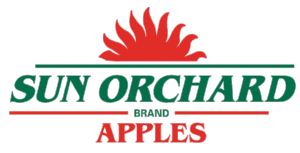 You can find Sun Orchard Jonagolds in retailers October through May.